AS SHOWN Clifton AV unit. 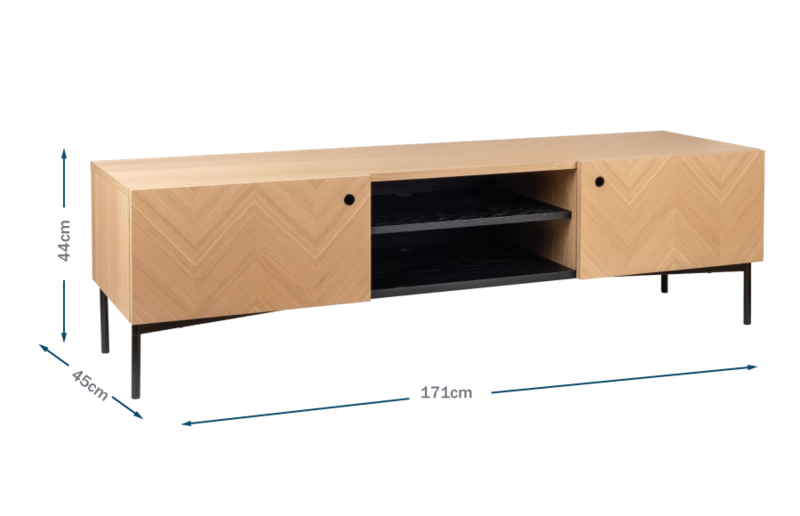 This AV unit features beautiful oak marquetry detailing creating a chevron pattern which is set against black accents. Inside the AV unit is a shelved storage area, perfect for placing DVDs. The Clifton AV unit will be a wonderful addition to your interior. Beautiful oak marquetry detailing creates a chevron pattern on the door fronts. Hidden cut out at the back of the shelves, perfect for concealing wires. Beautiful oak marquetry detailing creates a chevron pattern on the AV unit. Really pleased with it and glad I chose it.